In light of the recent spate of political correctness being applied to several Christmas songs whose only crime was that they were not written yesterday, I attach notes on perhaps my favourite, ‘The Christmas Song’. “Chestnuts roasting on an open fire” – have the chestnuts been sourced from a fair-trade third-world farmer? Is the open fire being fuelled by sustainably forested timber? “Jack Frost nipping at your nose” – there is a risk of gender stereotyping here. Could a Jacqueline do this job equally well? “Yuletide carols being sung by a choir” – the word ‘Yuletide’ is offensive to both non-Christians and atheists alike – it should be replaced with the less controversial term ‘holidays’. “And folks dressed up like Eskimos” – this is appropriation of traditional Inuit textiles and attire and therefore offensive to aboriginal and indigenous peoples the world round. “Everybody knows a turkey” – offensive to vegans. “Tiny tots with their eyes all aglow…” – ageist. “…will find it hard to sleep tonight” – making light of the medical condition insomnia. “They know that Santa’s on his way” – Saint Nicholas is always cast as a rotund Caucasian male, this is racist and sexist and also discriminatory against the clinically obese. “He’s loaded lots of toys and goodies…” – is the plastic used to make these toys recycled? The goodies will further add to obesity and diabetes problems. What is the carbon footprint of all this conspicuous consumerism? 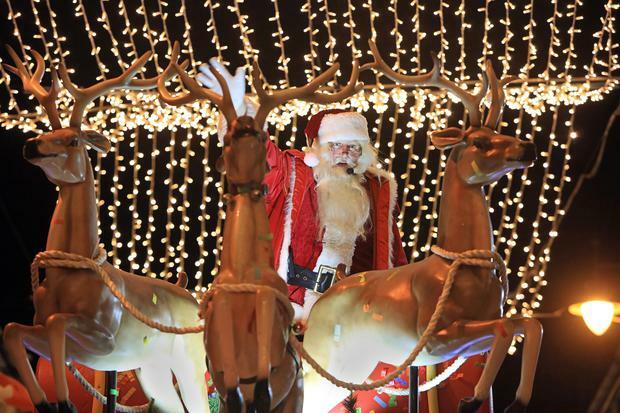 “…on his sleigh” – animal labour used – ban it. “And every mother’s…” – what about male/male partner relationships who are guardians of small children – homophobic. “…child is gonna spy to see if…” – anti-visually impaired. “…reindeer really know how to fly” – presumably causing more damage to the ozone layer in the process. “And so, I’m offering this simple phrase to kids from one to 92” – age discriminatory: what about infants under one and centenarians? “Altho’ it’s been said many times, many ways, ‘Merry Christmas to you'” – Merry Christmas to all staff and readers, and to all those so easily offended Merry Christmas to you as well. One of the more important aspects of the 1918 election being commemorated now was that it was the first time women were allowed to vote. The downside of that is that women, despite being a majority, have been grossly under-represented in the Dáil ever since. Much of the time they made up less than 5pc of TDs. At the moment, even after the introduction of a quota, just over 20pc of TDs are women. It has to be said, therefore, that issues that relate to women could have received a higher priority over that century. They would have received a higher priority if women had used their majority status in the electorate when they were in the polling booths. That fact was highlighted spectacularly recently in the US presidential election. That was the most significant occurrence in women’s lack of appreciation of their power in the electoral process for a long time. That unique opportunity to elect a highly competent and experienced woman to the most powerful political post in the world was lost. The fact that a century after receiving the right to vote more than 50pc of white women in the US voted against a woman president, and for her misogynist male opponent, was very damaging to women’s place in society and has to be seen as a mistake of historical importance. The only way to reverse that damage is for women to use their majority status at the next election to see they are adequately represented in the democracies of the world. Surely I’m not the only one who is finding it extremely irritating to be constantly reminded that if I have a television, I must have a TV licence to fund RTÉ. However, I have found a way to reduce the resulting effect on my blood pressure by keeping the mute button close at hand so I can render the announcement silent. I have relatives and friends in the UK who pay for a licence to provide income for the BBC; however, the service they receive is far superior to that of RTÉ with no advertising to be endured, to name one of many benefits. Please allow me to make a suggestion, through the good offices of the Irish Independent: that cribs in churches remain empty this Christmas in recognition of the many unborn babies destined for termination in Ireland. Those of us living in Britain are living in extraordinary times, watching the post-referendum relationship between the UK and Europe unfold day by day into a shape as yet unknown. I cannot recall in my lifetime any occasion when so much airtime was given over to debates about the Irish Border and the question of exports and imports between Ireland, Northern Ireland and Britain. At the same time, those living south of the Border in Ireland are living through a second, equally historic but very different post-referendum moment, as the legislation to provide long overdue abortion services for the Irish people finally makes its way through the houses of the Oireachtas. In 2019, I hope that the women of Northern Ireland will at least have the choice to access the healthcare system of Ireland as well as Britain for abortion services so cruelly denied to them at home. For how much longer must they be treated as a silent “export” from Northern Ireland because their own country refuses to care for them? Cooling the tae with milk from outside the bucket? When there was speculation that Mrs 39 was cooling the tae of The Man Who Knows Everything (TMWKE), Billy Keane did a lot of research on the subject. But he doesn’t inform the reader if TMWKE is single or if, as they say in north Kerry, he was “milking outside the bucket”.